Release Date:02/01/2019;Notes:Galveston's premier psychedelic/garage band, the Countdown 5. Here's a compilation with recordings dating from 1967-68, featuring a selection of their 45 sides for Toucan and Cobblestone. It includes the mod-psych classics "Uncle Kirby" and "Shaka Shaka Na Na" plus some amazing studio tracks which were never released at the time. Fab Beatlesque/Anglophile psych with great vocal harmonies, jangly and fuzzy guitars, organ... 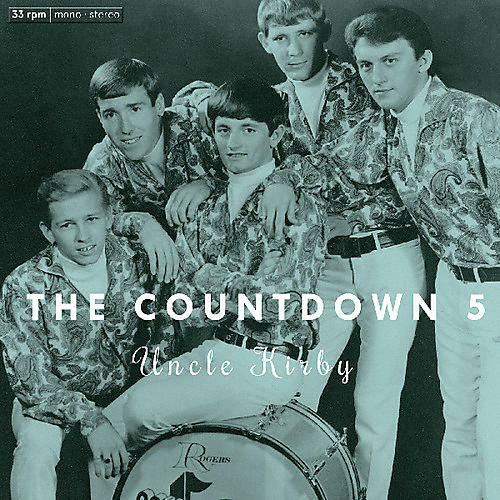 Formed in Galveston in the mid-60s, the Countdown 5 were one of the leading psychedelic/garage bands from Texas. From sharing stage with legendary Houston groups like Moving Sidewalks, the Clique, and 13th Floor Elevators, and opening for big names like Paul Revere & The Raiders, they went to running their own label (Toucan) and were also part owners of the renowned Walter Andrus Studio, home to bands like the Elevators and Fever Tree. Uncle Kirby is focused on the psychedelic period of the band (1967-68), including their most psych sounding 45 sides (in original mono mixes) plus unreleased tracks recorded at Andrus Studios which had never been released on vinyl, until now. Master tape sound Includes four-page insert with liner notes and photos.